We're trying to figure out exactly how the XP bar showed XP Debt. Specifically the purple and red colors. When did each appear and how? Was purple related to rest bonus, or just from debt while in the middle of a level? Could red and purple show at the same time? If you have any screenshots showing red and/or purple, please share them. I have just recently returned back to see how things are going. In fact, I managed to speak to you on Sunday (playing as BM Viconia), thank you speaking to me and aiding me that day. I can tell you what I remember on this subject (seeing as no one has come forwards thus far), but unfortunately my experience of the game is just before live and two years after go live. If you had no rested, the gold simply was eroded back to zero. You then got into negative XP (bar colour changes to red). This could increase to a full level bar of XP (although I never managed to do that badly to ever see it fully ). If you started earning XP then the red bar would go back down towards zero, until you got back to positive XP and the gold bar would go back to increasing as normal. 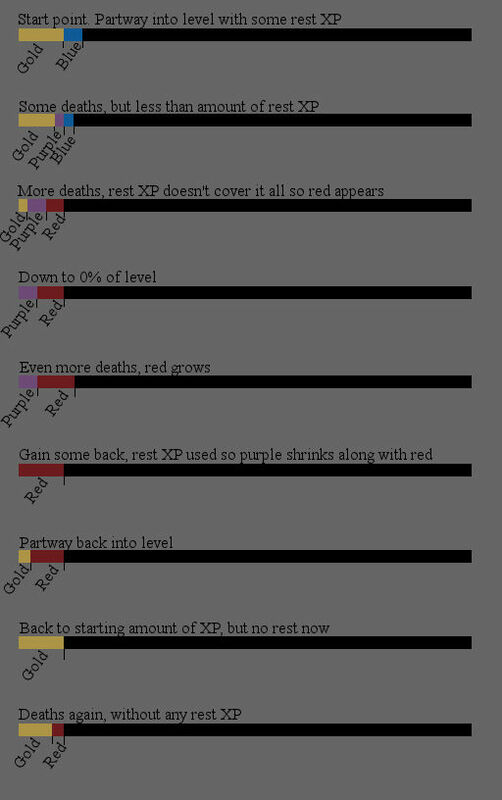 As for rested (Blue) the only difference is, this would be erroded down first before normal XP (Gold) would be touched. I do remember logging in once with a promising amount of rested only to destroy most of it trying to quest in areas I probably was a little too low to try at that point. You wouldn't get the previously rested XP back of course, as you have "used it". The only thing I do not recall is what would happen if you logged out with negative XP and if you would earn rested while in that state, as its not something I recall ever doing. My guess would be you wouldn't earn it while in a negative state, pretty sure most people wouldn't leave a character in that state anyway. Hope that helps in some way to either how you lot wish to make it work or jogging memories in others reading this.